‘Who Do I Call for..?’ Dial 2-1-1 for the Answer! 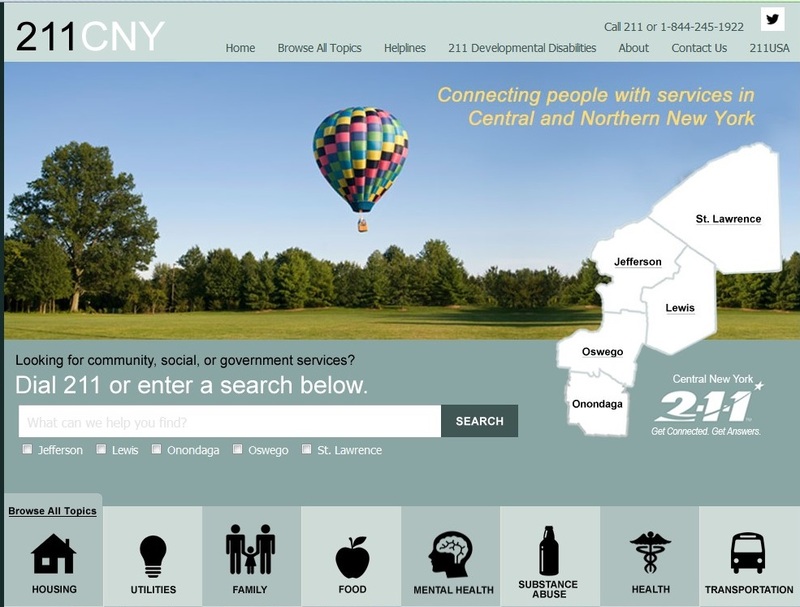 The 211 CNY website contains links to several topics and agencies in Central New York and is a valuable resource to community services in the five-county region. OSWEGO COUNTY – The Oswego County Legislature reminds residents about the 211 CNY Program which provides referrals to thousands of different agencies and organizations throughout Central and Northern New York. Residents in Oswego, Onondaga, Jefferson, Lewis and St. Lawrence counties can access the service 24 hours a day, seven days a week by dialing 2-1-1. Trained specialists are on call to assess each individual situation and provide the appropriate referral. The 211 CNY program also maintains a website, www.211cny.com, where individuals can go for additional information and assistance. Visitors can search by topic or by geographic area with a click on the appropriate subject link or their county image on a map. There are also quick links to access a developmental disabilities database and crisis hotlines for those in need.